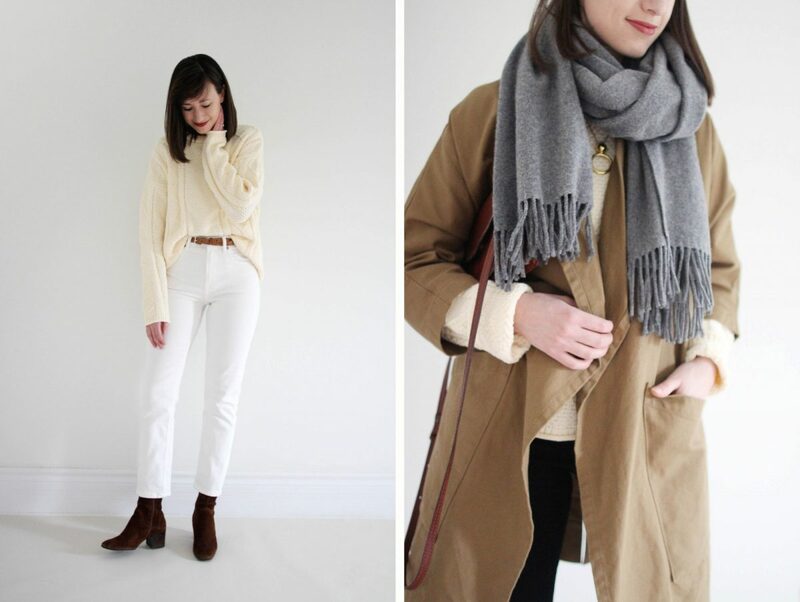 Today’s post is all about a winter closet classic. 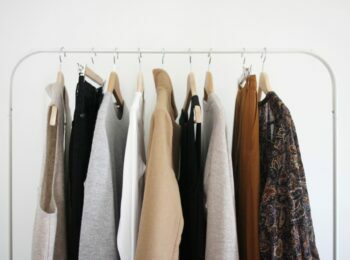 In my experience, there aren’t too many items that truly hold their own in a wardrobe and manage to transcend all eras, life stages and trends. Achieving the status of a “forever classic” is no easy feat but one that holds such credentials is indeed an age-old closet staple, the fisher’s sweater. It’s the kind of piece that anyone can wear no matter what your age, personal-style or gender identity may be and I love that about them! They also seem to be especially prevalent around this time of year when we’re craving coziness and familiar traditions. It’s been a few years since I’ve had a cable knit sweater in my closet but I’ve been holding out for the perfect rendition and I’m excited to be testing out one that might be just that. However, when I began pulling my thoughts together for this post I realized that I didn’t actually know where the fisher knit originated or what it’s significance was in the grand scheme of fashion history. So I looked into it and discovered some pretty interesting facts that made me love this sweater style even more! A brief history of the fisher knit sweater. My current winter style formula (chart below). 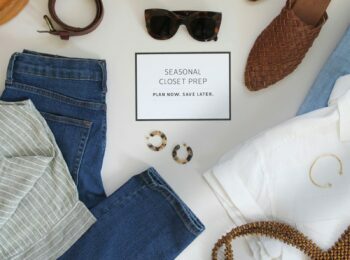 Quick facts on this particular one from Tradlands (+ a major reader discount!). The 3 different ways I’m styling it! Let’s get our fisher knit on then shall we? A fisherman‘s sweater (let’s leave gender out of it, okay?) 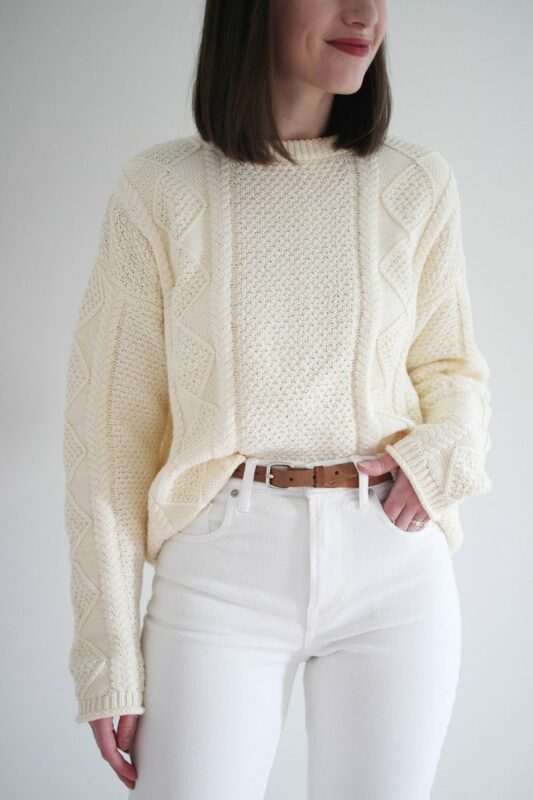 is the now common term used to describe what was originally known as an Aran Sweater, a style that takes its name from the Aran Islands off the west coast of Ireland. A typical fisher’s sweater is a hefty garment with cable knit patterns on the chest and can usually found in a cream colour. The original Irish fisher sweaters were made of unwashed wool, which contains lanolin, making them water-resistant and great for cold and wet environments. Production of this style is believed to have started in the early 1900s, although the style was modelled after centuries-old patterns and techniques. Vogue magazine is largely responsible for the styles mainstream popularity after featuring the fisher’s sweater during the 1950s. This appearance marked their entry into the North American clothing market. Not long after that The Clancy Brothers (a popular Irish folk band) appeared on the Ed Sullivan Show, wearing their trademark Aran jumpers. From then on, during the 1960s, even with all available knitters recruited from all across Ireland, distributors had difficulty fulfilling the incoming orders from around the world. One of my favourite facts about this style is that some stitch patterns have a traditional interpretation. In particular, an Irish fisher’s sweater that contains a honeycomb is meant to symbolize a hard-working bee (oh hello!). The cable, an integral part of the fisher’s daily life, points to a wish for safety and good luck when fishing, just as the diamond is a nod toward success, wealth, and treasure. The basket stitch represents the fisher’s basket and a hope for a plentiful catch. Thanks to Wikipedia and Irish Indeed for this history. This particular fisher knit was sent to me by my generous friends at TRADLANDS and I’d been waiting (as patiently as I could) for it to arrive since early this fall. 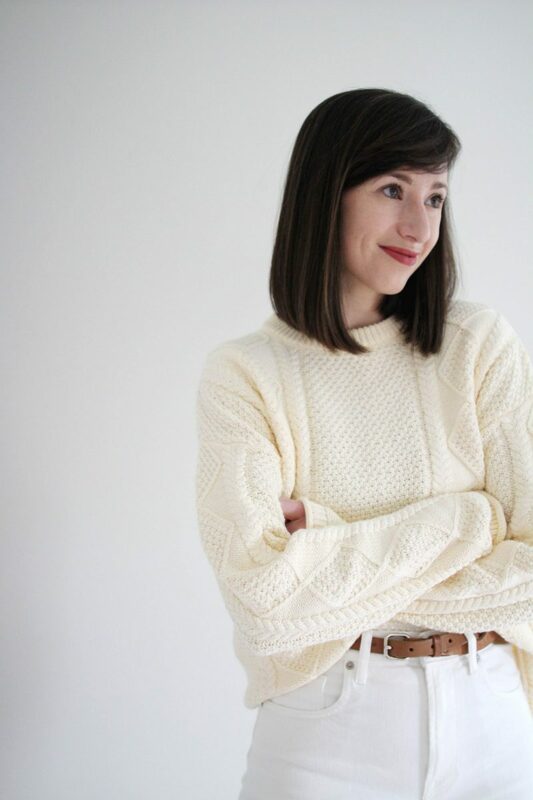 I’d searched for a vintage sweater like this one for years and despite trying on dozens, none of them were quite right. Too bulky, too long, too itchy or too synthetic were just a few of my goldilocks issues until I spotted this one. My favourite things about it are the truly classic pattern (it’s got the honeycomb, the cable channels and the diamond panels!) and the fact that it’s 100% cotton, so it was soft from the start with zero itch! FIT: I opted for a size Medium and the fit is quite oversized, which is what I wanted. For reference, my measurements are 32 inch bust, 26 inch waist, 37 inch hip and I’m about 5’7 and 125 lbs. It hits me just below the hip and the sleeves extend to my wrists. I could have sized down to a Small and it would have fit relaxed but not as roomy through the body. Available in sizes XXS – XL. FABRIC: 100% cotton, soft and mid-weight. 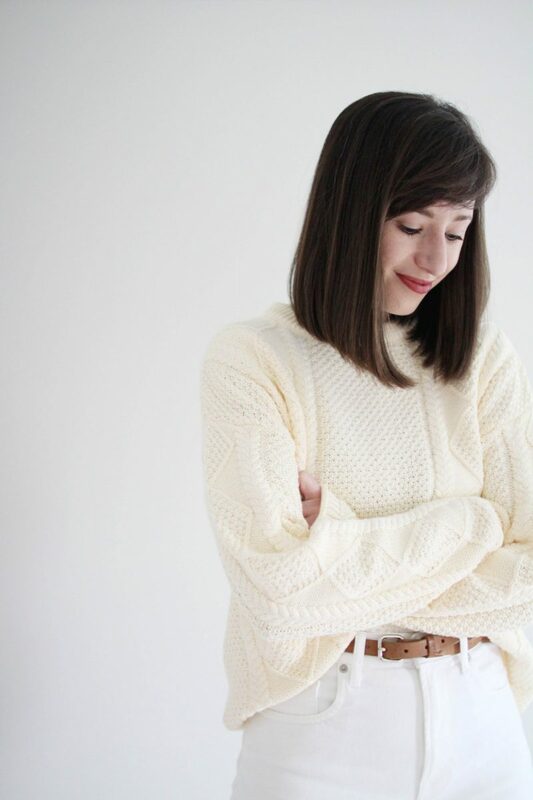 I wasn’t sure if I’d love a cotton sweater like this but it’s incredibly cozy and super soft. I wore it without a base layer the first day and it feels amazing on the skin, not itchy in the slightest. 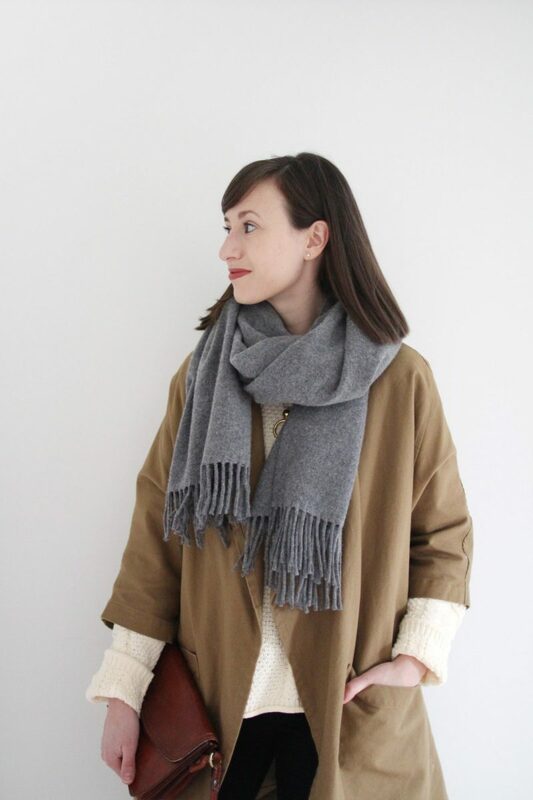 It’s also very warm but more breathable than a knit like wool or cashmere so it’s great for layering under heavy coats or over a base tee as needed. This knit holds it’s shape well and creases smooth out easily with wear. It falls close to the body thanks to the heavy weight and this also keeps it from feeling boxy or drafty when worn loose over jeans. Being cotton it will be less inclined to pilling, pulls or fuzz than wool and easy to care for. 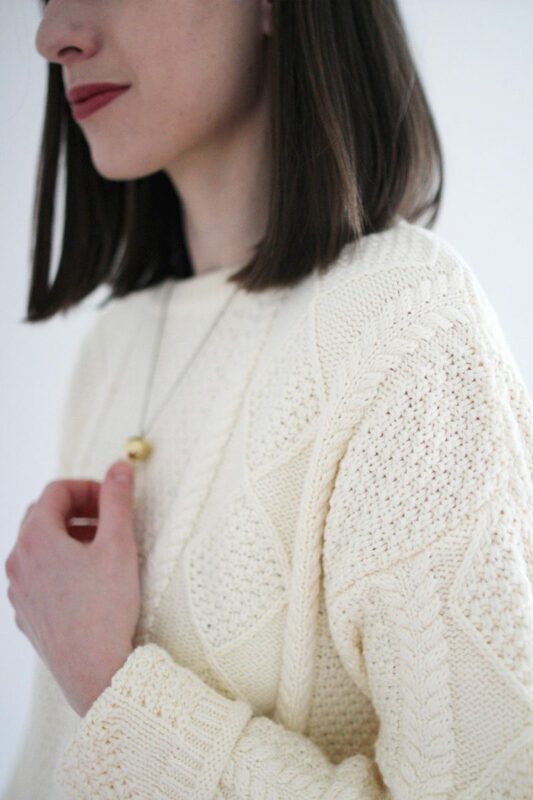 COLOUR: I chose Shell because it’s the more traditional, classic cream tone that fisher sweaters typically come in and I wanted the most timeless rendition I could find. These photos are true to real life in terms of how it appears and compares to a bright white. It’s a buttery, natural, off-white cream tone. 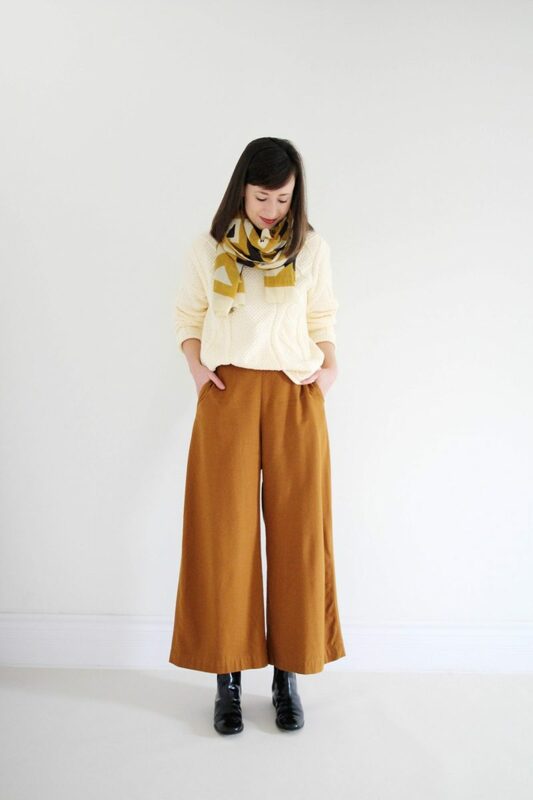 It’s also available in a gorgeous Sienna, an earthy, umber tone, close to that of my wide-leg pants in Look 2 below. Use ‘STYLEBEE20’ to save 20% off any TRADLANDS order now through January 2nd, 2019. Orders over $200 USD ship free worldwide. Drop shoulder – Gives it that oversize, slouchy fit and feel. Classic, timeless knit pattern – All the key elements of a traditional Aran sweater but in a soft cotton and modern fit. Thick, ribbed crewneck collar – So cozy on the neck without being bulky. Rolled hem and cuffs – For a finished edge that’s easy to style, roll, cuff and tuck as desired. CARE: For best care, machine wash cold, lay flat to dry. Wear a base layer underneath and you probably won’t need to wash it more than once a season. MADE RESPONSIBLY IN: Shanghai, China. More on how TRADLANDS is committed to responsible production here. FREE shipping on all orders over $200 USD. SWEATER + JEANS – The foundation of this first look is super basic, just a chunky knit sweater worn loose over a pair of black jeans. Something most folks will be able to throw together no problem. I cuffed the sweater sleeves to keep them at wrist length. SLEEK BLACK BOOT – To keep it simple and streamlined I added my sleekest black ankle boots for a little refinement and structure thanks to a pointed toe and block heel. Combined with the black jeans this elongates the leg. FOCAL POINT – Then I added a focal point with my pendant necklace. I find when I wear a necklace that lands higher on my upper body (versus a long one) it draws the eye up and balances out a larger piece like this sweater, which can be all-consuming when worn loose. STATEMENT COAT – From there I wanted to get some contrast and interest going on so I layered on my Harper Jacket, which never fails to be a show stopper. 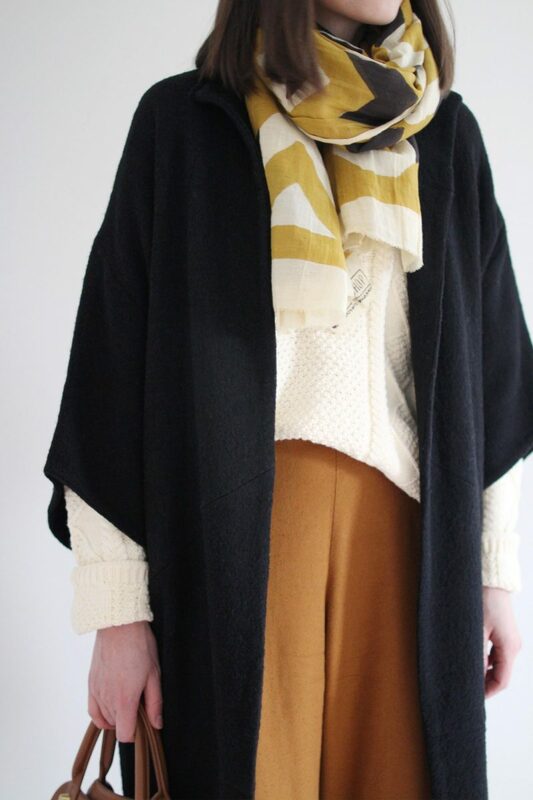 The wide sleeves easily glide over the sweater and the cropped length lets the cuffs peek out, which I always love. WARMTH – For an additional dose of coziness I wrapped on my favourite chunky grey scarf and loved how well the grey wool and clay canvas work together. Yay for a new colour combo! EARTHY PALETTE – The final touch was my oxblood vintage bag, which was the fourth colour and just the extra bit of depth that the look needed! VINTAGE BAG | Similar vintage here, swoon worthy here and I love this little one. 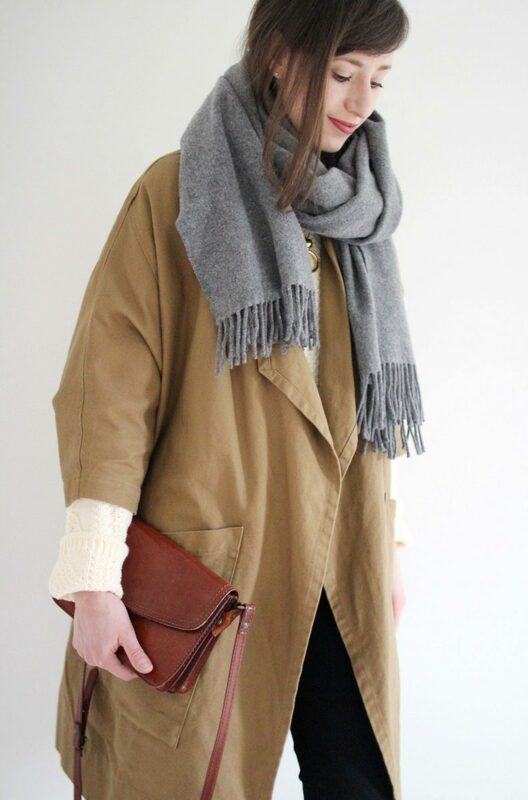 CANADA SCARF | ACNE STUDIOS | Made in Italy | Similar for less here. NECKLACE | old | Similar option here. SWEATER + WIDE-LEG SILK PANTS – Even before the fisher knit arrived I knew I wanted to try it with my raw silk wide-leg pants. My thing with wide-leg pants is that 99% of the time they look best when paired with a higher visual mid-point. This sweater didn’t work to fully tuck in (the raw silk isn’t thick and the sweater looked bumpy underneath) but as I was pulling it out to try something else one side got stuck and I really liked the result. So side tucking the sweater into my wide leg pants ended up being the right call for this one! I tried the sleeves cuffed first but preferred them simply pushed up my forearm instead. 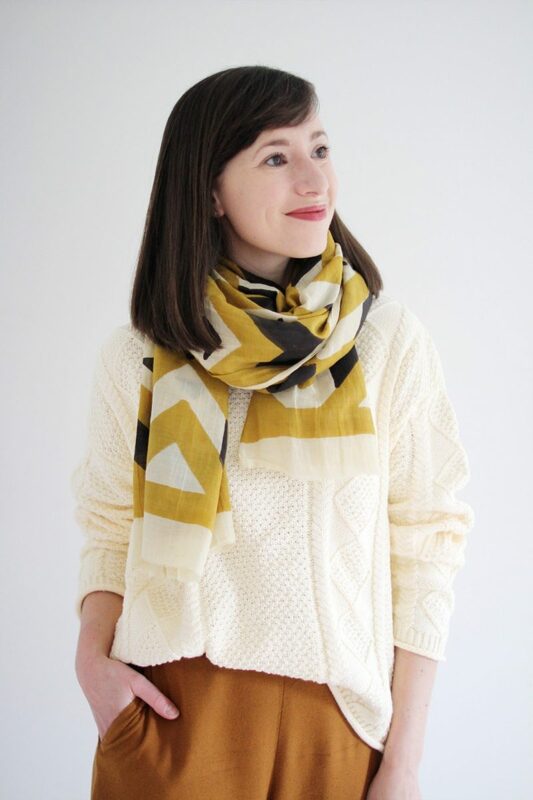 POP OF PATTERN – I’ve been meaning to try this scarf in a look with these pants for a while now. 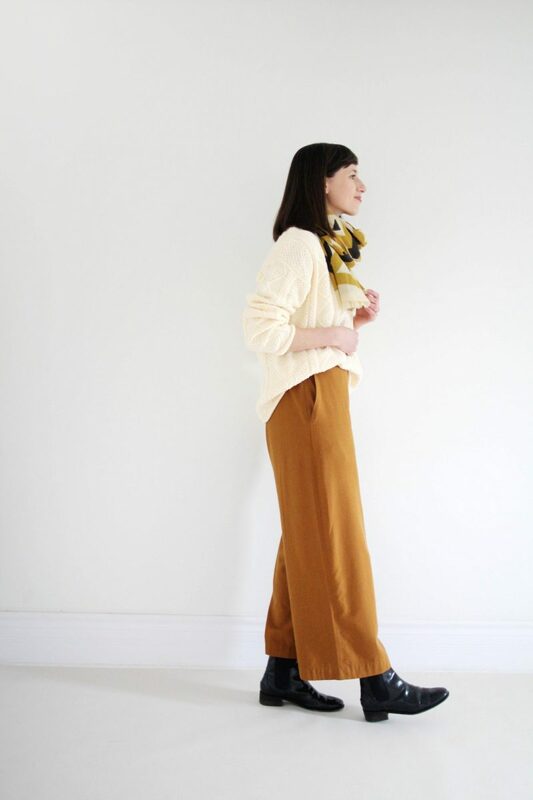 I wasn’t sure if the mustard in the block print would work with the umber pants but I think it totally does! Then, in a happy coincidence the cream in the scarf was almost exactly the same as the sweater. I love finding cohesive elements in a look that help to explain why it’s pleasing visually. 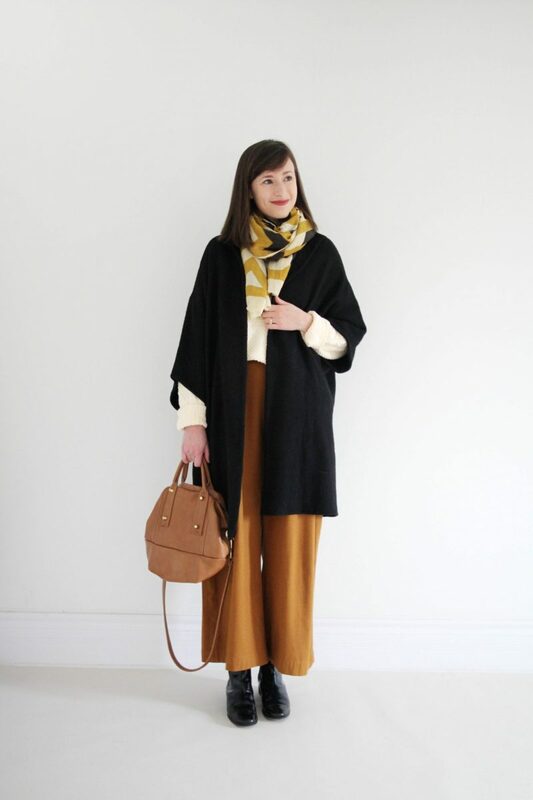 POLISH – From there I decided to pull from the black in the scarf print and add more continuity through a pair of black Chelsea boots and a black wool cocoon coat. When in doubt I almost always find that black adds a level of sophistication and polish to any outfit. TONAL ELEMENTS – Whenever I feel like there is a lot going on in a look I try to finish things off subtly. For instance, this look included a new sweater, a bold colour pant, a jolt of pattern and some strong black elements so I went for a bag that would blend in easily. I love how this colour palette came together and I’m so excited to wear this one out soon. WOOL COAT | old | ELIZABETH SUZANN | Similar here and here. CHELSEA BOOTS | old | Similar option here. 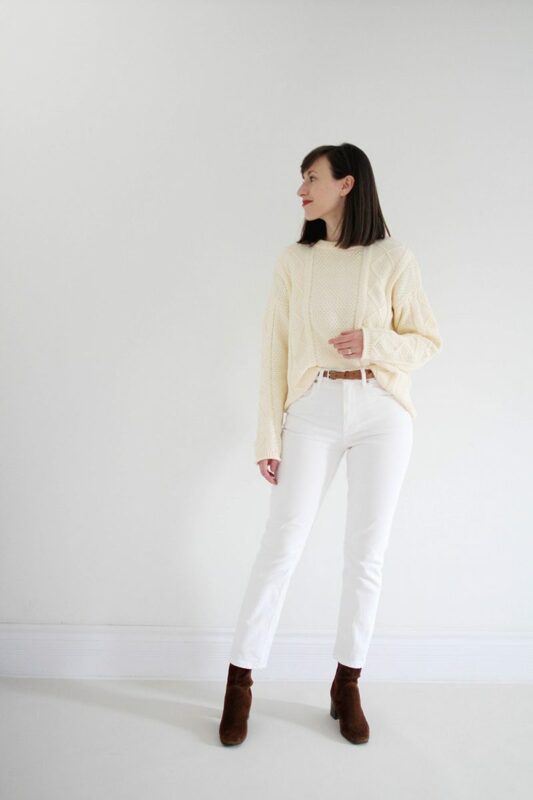 CREAM SWEATER + WHITE JEANS – In my recent post on winter style I shared some Pinterest inspiration I’ve been loving lately and one of the themes was layers of light neutrals. It makes for such a fresh take of cold weather style and I couldn’t wait to try it out. 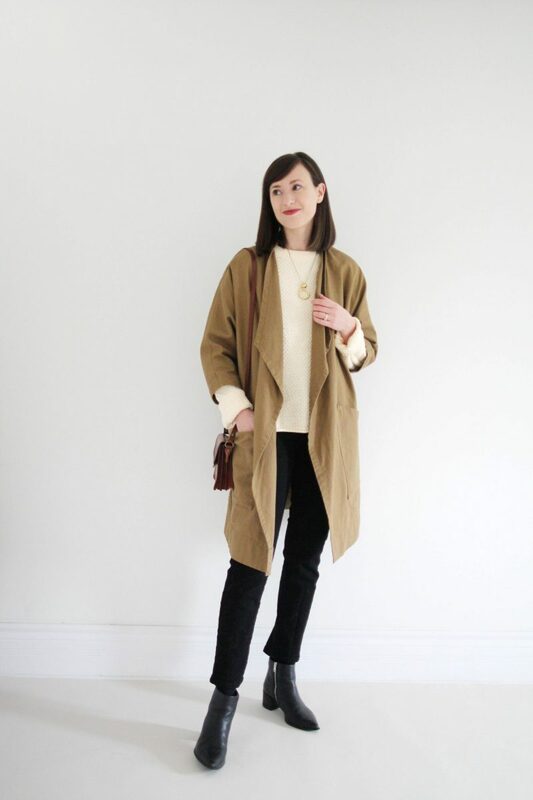 When this sweater arrived and I saw how buttery the colour was and I knew it would pair beautifully with white and warm neutrals like camel wool, tan leather and chocolate suede. 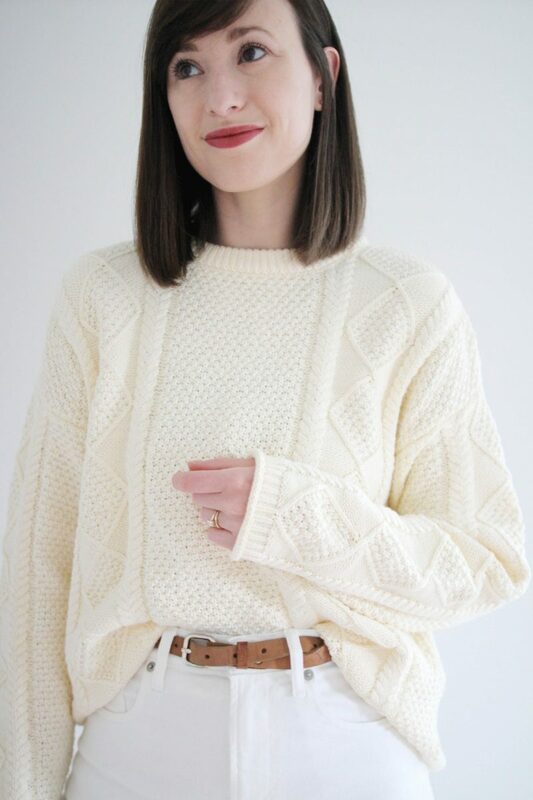 BELT – I’ve saved a lot of pins and posts like this one that feature a chunky knit sweater tucked into jeans with a belt. I was really excited to see if I could make it work and I dare say I did! I actually found the belt made it more comfortable because it held the waistband in place better than without. Plus it just feels more put together somehow. 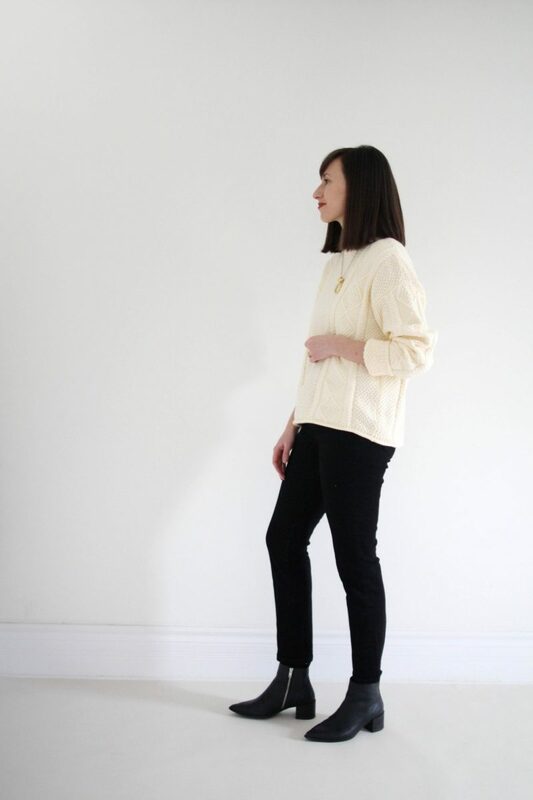 FRENCH TUCK WITH A TWIST – I find it a little bit tricky to French or front tuck thicker sweaters into jeans but I discovered a little trick! If you fold the bottom 2-3 inches of the sweater under and then tuck the doubled up fabric into the waistband it works great. It feels better, looks cleaner and it helps to keep the belt showing. I’m definitely using this one again! See my stories later today for this trick in action. 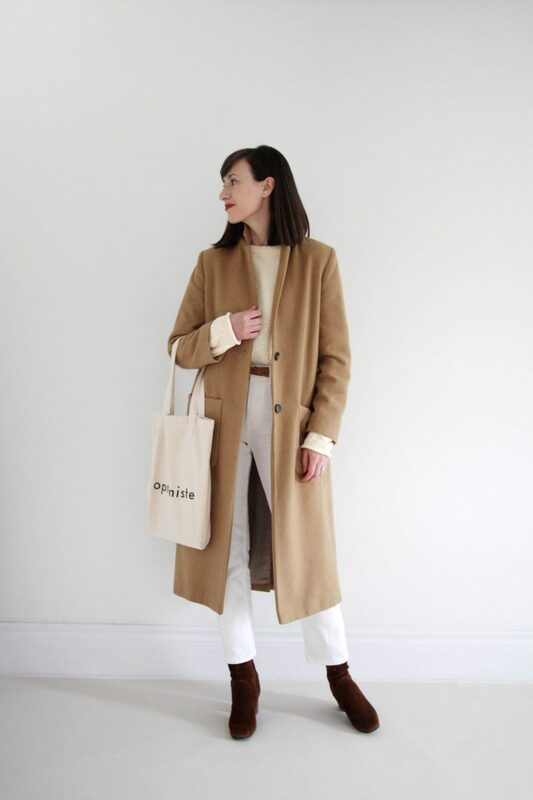 LONG COAT + LONG SLEEVES – For this look I let the sleeves out long so they extend past my wrists for a borrowed from the boys vibe. A lucky coincidence is that they stick out from my coat sleeves for a nice touch of added layering. TONAL CONTRAST – All the elements in this look are in a similar warm tonal range. 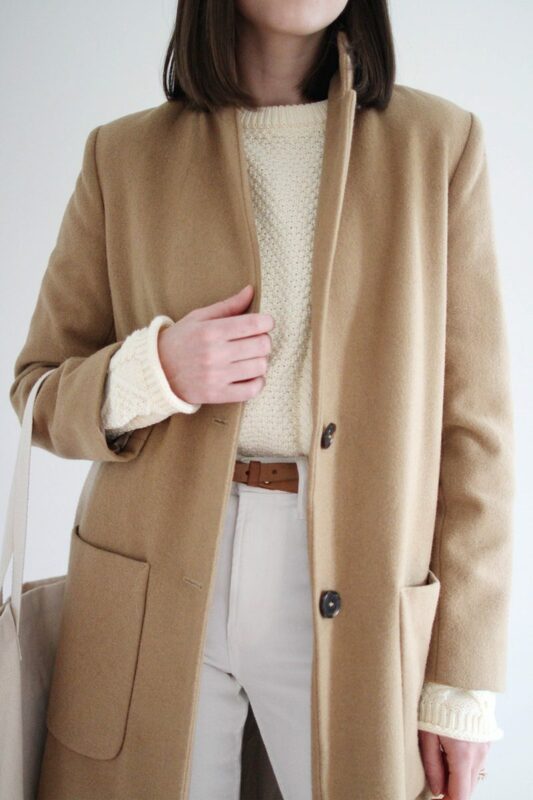 It’s like the outfit version of an eggnog latte with nutmeg on top! 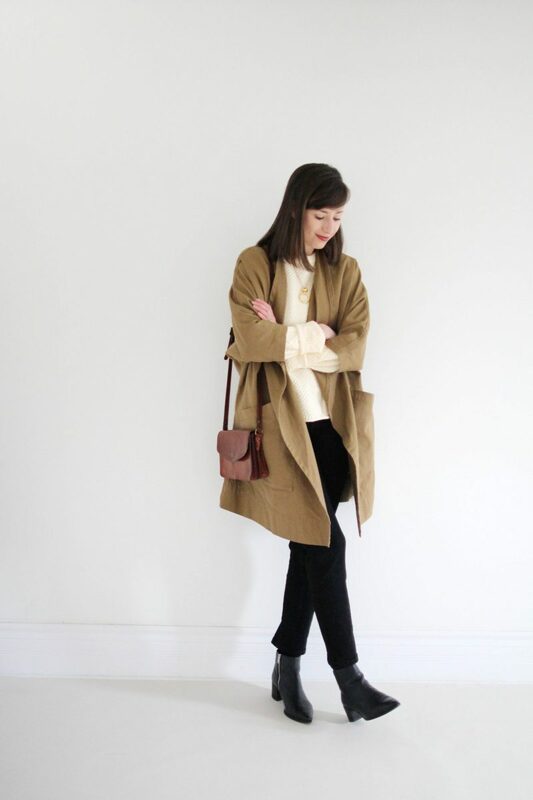 CAMEL WOOL COAT | old | Similar here (long and belted) and here (same shape but shorter). TOTE BAG | Similar option here for $15 USD. BELT | old | Similar here and here. So there’s a bit of history and some style ideas around the classic fisher’s sweater! Which of these outfits is your favourite? 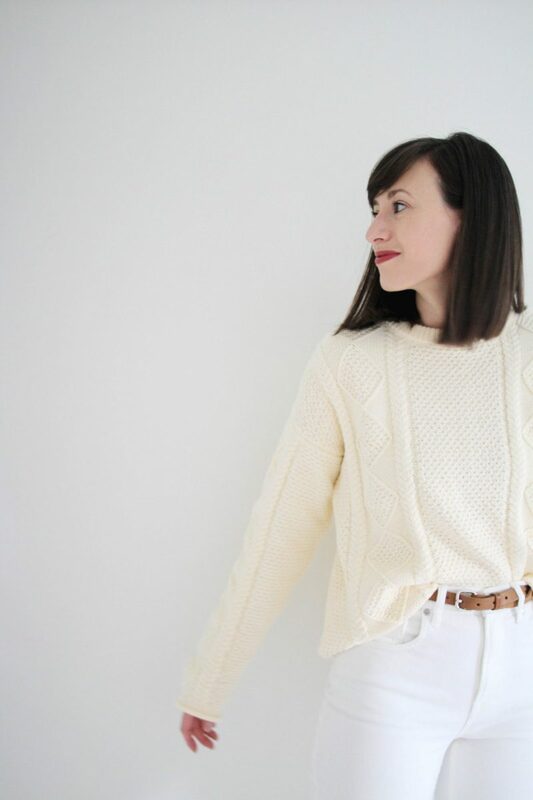 Do you have a cable knit or special sweater in your closet that these ideas might work for? THANKS FOR READING & DON’T FORGET TO ENTER THE HOLIDAY GIVEAWAY! 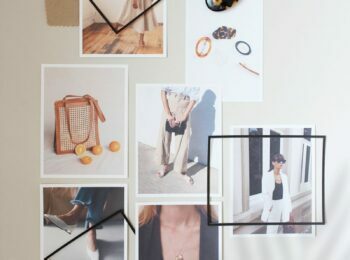 STYLE BEE PARTNERSHIP: This post was produced in partnership with TRADLANDS, a brand I have worked with and supported for a couple of years now. This item was sent for me to try out and share in this post. While I receive a commission on sales made using the exclusive Style Bee reader code I never recommend brands or items that I am not personally interested in and feel are a worthwhile investment. This type of partnership enables me to work with independent brands and helps to support my small business. All opinions are entirely my own. Thanks for reading and your support of Style Bee! I just received this sweater in Sienna and wore it yesterday. 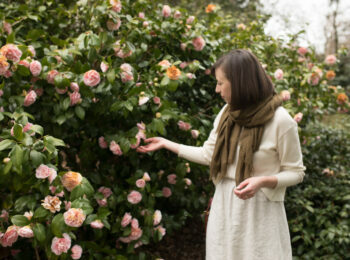 It’s gorgeous – I adore the soft cotton, the beautiful cables, the generous fit. 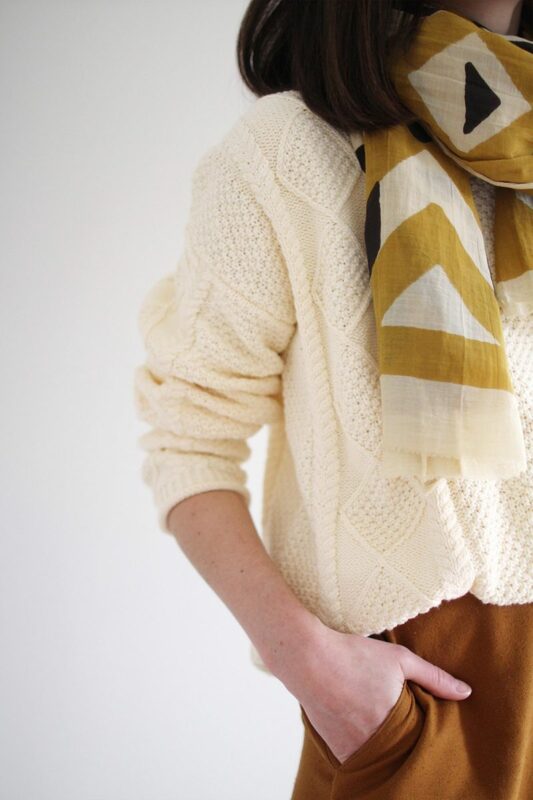 It’s a perfect cozy winter sweater, and the rich Sienna color is even more beautiful in person. 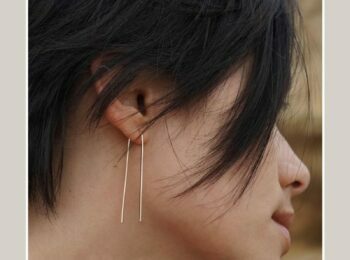 I must say though that as the size increases, the length increases quite significantly. 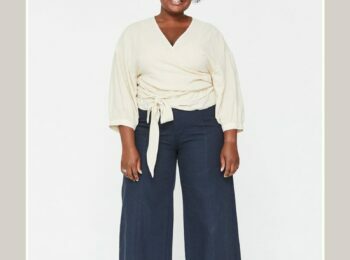 I notice that your medium is proportionately longer than the model’s small on the Tradlands site (it falls just below the waist on her), and my XL is *very* long. (For reference I usually wear a size 14/16 top, and the XL is listed for 16/18.) 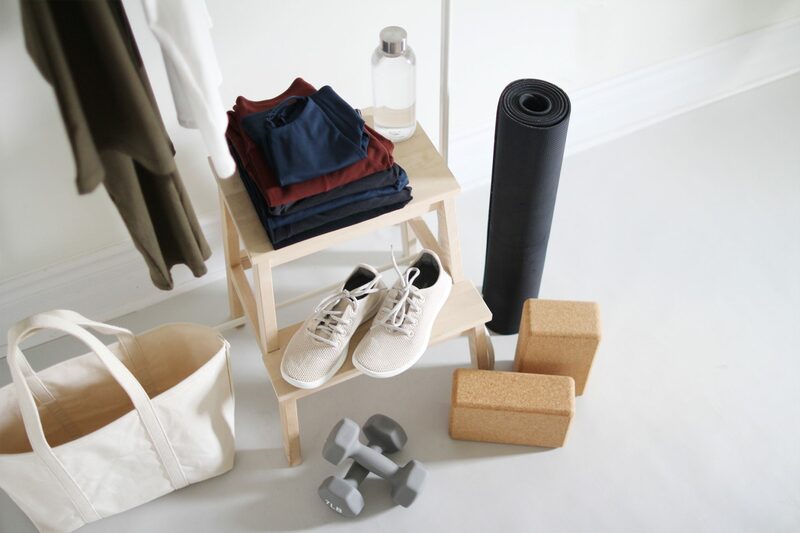 Therefore, I cannot imagine being able to do even a half-tuck/front tuck with the larger sizes, probably beginning with L. Just a little note of guidance for your readers considering this purchase. Love how you’ve styled yours though!! We were in Ireland a couple of years ago and ferried over to the Aran Islands. We were told that the fishermen’s wives knit the sweaters with somewhat unique patterns, maybe slight variations, so that they could be identified if lost at sea. The seas could be really rough, making it a hard and risky occupation. I love the sweater you chose and the styling of all three, especially the third. In a slightly grim note each fisherman’s wife had their own pattern of sweater they knitted so if their husband/ son was drowned they would be able to identify the body when it was washed up by the sweater. 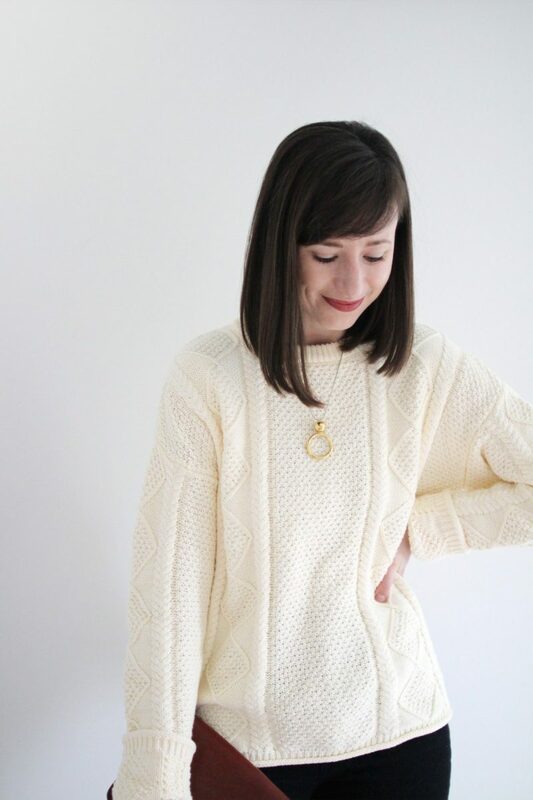 I love my huge chunky heavy new wool cable sweater almost as much as the one my mum knit me in the 1970s! I’ve had a 100% wool Irish fisher sweater for years and, while I love it on super cold days, it does add bulk and weight to my look. I think the cotton version deserves a think for those reasons. p.s Loved the history of the sweater. Thanks for adding, Lee. p.p.s. Your lipstick? I’m always impressed with your make up too! Look 1 is my favorite. I have a sweater like this in white. It’s cotton, but I think it’s a stiffer cotton than your sweater. I think I will wear it today with black jeans. My favourite is look three. 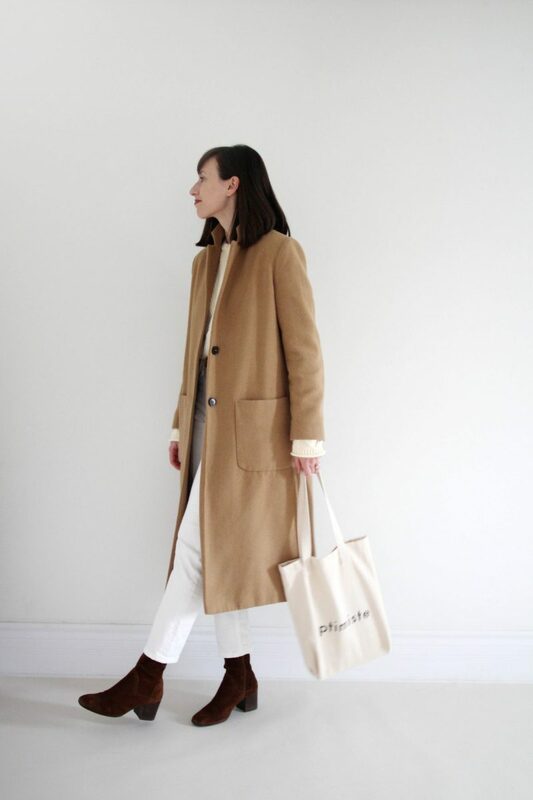 That camel coat is divine. The sweater is such a great find!